Last night’s “Asian Basketball Showdown” between the Changwon LG Sakers and Barangay Ginebra San Miguel featured a lot of fun, games, and hoops. It had a feel of an all-star weekend, complete with dunk-offs, two-man shoot-out, three-point contests, and a six-year old baller who had crazy handles that would make Jamal Crawford jump out of his seat. 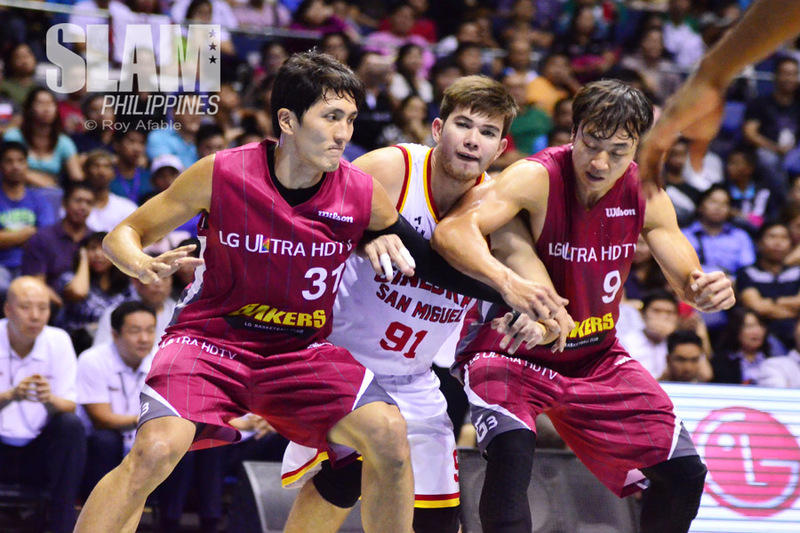 The main act of course was the battle between Korea’s LG Sakers and our own Barangay Ginebra San Miguel. It might have felt like a night of festivities, but on the hardwood, it was an all-out competition between the two squads. LG wasn’t kidding when they said the Sakers were one of the most popular and competitive teams in Asia as there were numerous Korean fans in the stands cheering them on. And as advertised, they were one tough cookie to handle. The LG Sakers showed astounding shooting throughout the contest and their import Christopher Massie proved to be a handful against Greg Slaughter. Massie led his team with 24 points and 14 rebounds. 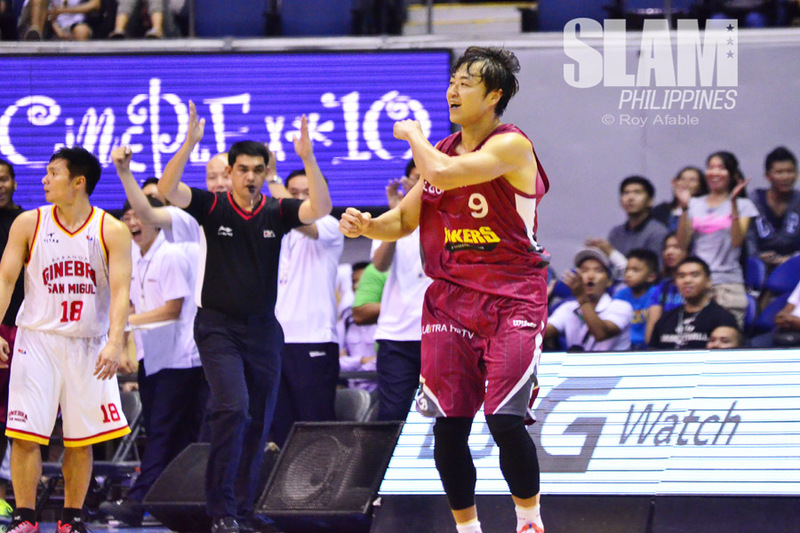 Yong Hwan Kim and Seung Ho Ki were like a pair of hired assassins as they kept sniping away from beyond the arc. From downtown, Ki went 3-for-6 while Kim shot 4-for-13. The festivities continued as the game even had a three-point contest during halftime featuring four players from each of the two squads. Instead of counting individual scores, the combined efforts of the four were then combined to form a team score. Can you imagine a PBA halftime show that had the players themselves joining? Barangay Ginebra unveiled their new Titan jerseys during the game, flashing white with highlights of gold and red. The game was also an opportunity to play their rookie Rodney Brondial, as the former Adamson Falcon logged heavy minutes in this exhibition game. Also, Joseph Yeo was in action in his first Ginebra game starting alongside Josh Urbiztondo. “The Ninja” had a solid outing in 27 minutes, getting nine points, three rebounds, and four assists. Last night was also the chance for Ginebra and PBA fans alike to welcome home their two Gilas stars LA Tenorio and Japeth Aguilar. The two didn’t play as they just recently arrived from Spain, but that didn’t stop the crowd from cheering and clapping for their FIBA World Cup heroes. 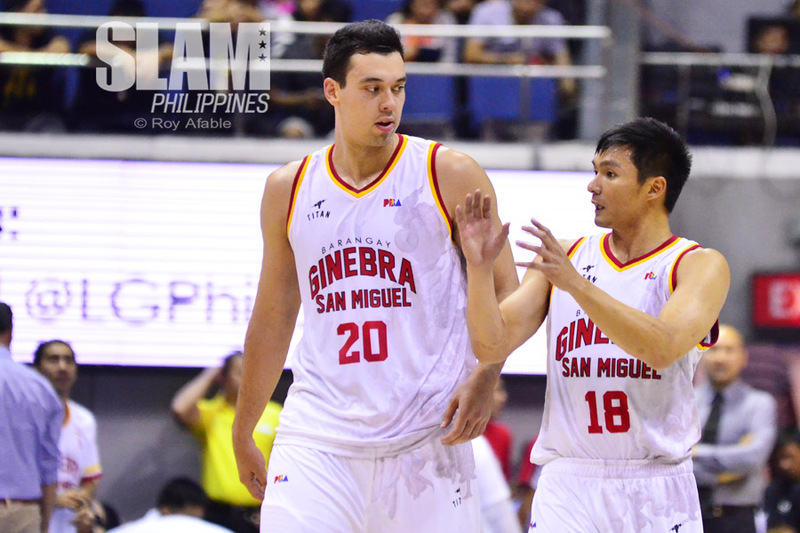 Greg Slaughter was the main man for Ginebra as he tallied 23 points and 12 rebounds. Chris Ellis and Mac Baracael also contributed by scoring 13 points each. It was a night of playful fun and competitive exhibition between the squads but ultimately, the LG Sakers came home with the victory.